The billowing harmonies and full-service orchestration on “Ms Grace” are half a bluff, with the doo-be-doo-be backing vocals telling a truer story. This is an old-fashioned song of devotion, the modish mid-70s “Ms” the only real nod to modernity by a band enjoying a commercial indian summer after more than a decade of work. The collective protagonist may not even have “Lady Grace” yet but he doesn’t care: her presence is enough and more. This is feelgood, stress-free soul music, each singer stepping respectfully up for his turn, none of them muscling out the others. It’s restful, for all its liveliness. A nice song, no more, no less, and while it wasn’t exactly disco it was surely helped along by the disco boom. Can’t say I loved it at the time but it’s one of those songs where you look back and smile. And the band were rather gracious themselves, by all accounts – apparently when they were doing TOTP in March that year, they went over to the Goodies to tell them how much they’d enjoyed “The Funky Gibbon”. Which would probably have made Bill Oddie’s week at least. I quite liked it then, not bothered about it now. Um, that’s it. Apart from: What kind of dance was “The Clutch” then? 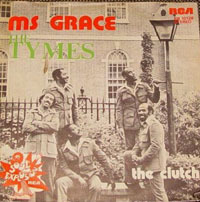 Another beneficiary of the slow month of January, “Ms Grace” is a pleasing-sounding throwback to the showy days of doo-wop with due nods to Gamble and Huff in its introduction (though it wasn’t a Philly production) and rather charming in its polite obsessiveness and natural, good-humoured swing, though I note that it hardly registered on the Billboard Hot 100. After that they had just one more hit in Britain, with “God’s Gonna Punish You” (not as interesting as the title might suggest) and the only real qualm I have about “Ms Grace” is that it kept Gloria Gaynor’s beginning of time “Never Can Say Goodbye” at number two. Am I the only one who insists on hearing the Tymes’s 1974 hit as “You little truss maker”? Anyway, both that and the title under consideration are perfectly nice representatives of Philly Soul without making me feel overexcited and needing to lie dow. Or get up and dance, for that matter. I prefer the earlier one because it has associations with bopping in a steamy cellar in Manchester. Erithian, I quite like the new color scheme…it’s friendly and at least for me not difficult to read. I already can’t remember what this place used to look like. As for Ms. Grace, I’m listening right now for the first time and it seems pleasant enough. I have nothing to say about the song, but the new decor is really fab. This might be the archetypal ‘5’ number 1, in that its agreeable to listen to, but no more affecting than in a mild toe-tapping sort of way. It’s certainly not a song that’s ever come unbidden into my head when I’ve been in love! Did this song make the charts in the U.S. at all? I never heard it until I Napster-searched the Tymes a couple years ago based on fondness for You Little Trustmaker, which itself was a pretty minor hit here, in my awareness. But other than that I go along with the general consensus of “nice.” Actually I associate this band’s sound not so much with Philly as with the “Beach Music” genre exemplified by Chairmen of the Board. (I wasn’t even aware that such a genre existed until the Napster era began, and then learned there was a Name and geographical center — the Carolina shores — for this upbeat, pop-py soul fluff I always loved). Like its immediate predecessor, the placing of “Ms Grace” at the top was a delightful surprise to me and once again Johnnie Walker purred his pleasure, calling it “an excellent record”. And so it was. A strong melody, a sing-along chorus (although for “satin, perfume and lace” I used to sing “sat in for the human race”, but there you go) and an all round fine production. I think the wind must have changed the week it hit its peak, as it arrived at number one very suddenly and then fell off from a great height seven days later, I seem to remember. Nevertheless there have been far worse number ones, although its accession to top of the heap surprised many, including The Tymes themselves, I believe. Btw, I don’t suppose for one moment that The Tymes were aiming this at the divine and much lamented Princess of Monaco (she was still with us at that point) but it does give me an opportunity to just mention that I saw “To Catch a Thief” again a little while ago and I really defy anyone to name a more beautiful, classy and yes, graceful woman than Grace was in that picture. Simply stunning. “God’s gonna punish you” is a truly bizarre song. The airborne melody and light easy production makes this immensely likeable but not especially loveable. There’s no jag or bur on which you can really hook your emotions. While the arrangement is quite densely packed it tries not to let on so the thing perhaps feels a touch more disposable than it needs to. Pleasant enough. Nice re-fit for Valentine’s Day. Should have a chocolatey version done by Good Friday. So are we to expect a changing scheme in keeping with upcoming hols ? That’d be quaint. No, me too. I still think of it as that. The Moments were another US soul harmony group who had hits in the UK that never made it back home, I think that happened to ‘Dolly My Love’ and ‘Girls’ but I could be wrong as usual. The best of these splinter groups, I felt, were The Miracles (sans the Smokemeister). Twas they who come up with “Love Machine”, an enormous hit in the US and top three here. Yes, by the time “Dolly My Love” was released, The Moments had indeed become detached from their Whatnauts, which sounds bloody painful to me. The Moments hook-up with The Whatnauts (what a great name) was just for that one single. The Moments had been around a long time putting out wonderful records on Sylvia Robinson’s Stang and All-Platinum labels. Another Philly-soul hit with sumptuous production and classy soulful vocals replete with 50s style doo-wop backing. This was acutally cut in New York but did feature the TSOP strings & brass sections. Written in part by a member of the US group Orleans (of ‘Dance With Me’ fame) it’s a pleasant enough way to spend 3 minutes without necessarily wanting to spend anymore time with it. This is one of those singles that it’s easy for me to imagine slipping through the cracks if fate hadn’t intervened; had it not been a hit, Ms Grace would surely command ridiculous money among beach music/two-step collectors. Other major hits I’m thinking of that could have had an afterlife in Record Collector wants ads if it weren’t for some fortunate radio play include Whiter Shade Of Pale and When A Man Loves A Woman: Procol Harum and Percy Sledge are names that sit so neatly alongside obscurities like Felius Andromeda and Tintern Abbey, Henry Lumpkin and Ray Pollard. As for The Tymes’ late bloom, it’s no earworm but a gently unfolding flower, a deceptive delight. The intro is surely one of Popular’s least likely (it doesn’t suggest they were aiming for either number one or even club play), while the moment the drums and brass come in is like somebody opening the door into summer.